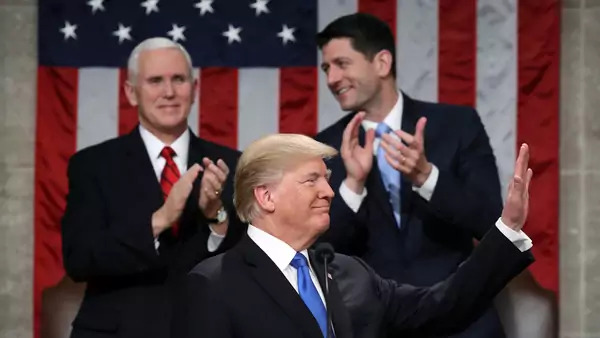 President Donald Trump says he will deliver his second State of the Union address next Tuesday night as planned. The question is, where will he deliver it? House Speaker Nancy Pelosi last week cited security concerns in asking the White House to delay the address until the partial government shutdown ends. The administration dismissed those concerns, and Trump said early this afternoon that he intends to travel to Capitol Hill to speak. However, he can’t compel the House to host him. Such addresses require the House to join the Senate in passing a joint concurrent resolution formally convening Congress to hear him. And late this afternoon Pelosi made clear that wouldn’t happen until the shutdown ended. Assuming that Pelosi holds firm—and there’s no reason to think she won’t—and no quick deal is reached to fund the government—and there’s no reason to think there will be one—the White House has a wide range of choices for alternate venues, including the Senate chamber, the Oval Office, and a rally outside of Washington. Trump could also scrap the speech and just send a message to Congress. Lost in the spat over whether the president will or won’t speak in the House chamber is what he will speak about. The wall with Mexico would seem to be a certainty given that is why 800 thousand federal workers have been furloughed for more than a month. Trump is likely to tout a strong economy and the trade deals he struck last year. He could possibly revive the infrastructure plan he proposed last year that essentially died on arrival, or he could lay out the middle-class tax cut “of about 10 percent” that he touted just before last November’s midterms. Foreign policy types will be watching to see what, if anything, he says about tariffs, ongoing trade talks with China, the withdrawal of U.S. troops from Syria, NATO, North Korea, the Intermediate-Range Nuclear Force Treaty, Venezuela, and the future of the U.S. commitment to Afghanistan, among other topics. While we wait to see what gets mentioned (or unmentioned) in what could be a traditional State of the Union address or not, here are ten facts about the State of the Union that you may not know. 1. The tradition of giving a State of the Union Address is rooted in the U.S. Constitution. Article II, Section 3 stipulates: The president “shall from time to time give to the Congress Information of the State of the Union, and recommend to their Consideration such Measures as he shall judge necessary and expedient.” Although the Constitution doesn’t define “from time to time,” by tradition presidents convey that message once each year. The Constitution says nothing about when the president should deliver the information or how he should deliver it. Until 1934, the State of the Union message was typically delivered in December rather than January. 2. For more than a century, the State of the Union was delivered to Congress in writing rather than in a speech before a joint session of Congress. George Washington delivered the first State of the Union address—or “Annual Message” if you prefer—in person and in New York. (The Big Apple was the capital of the United States from 1785 to 1790.) John Adams did likewise during his one term in office. Thomas Jefferson, however, abandoned the in-person speech for the written message, perhaps because he wasn’t a great public speaker. Presidents followed Jefferson’s lead until 1913, when Woodrow Wilson revived the practice of giving a speech. Ever since FDR, presidents have almost always used speeches rather than written messages to fulfill their constitutional obligation to inform Congress about the State of the Union. 5. During presidential transition years, Congress sometimes receives annual messages from two presidents within a span of weeks. Outgoing presidents can give a State of the Union address even if the incoming president is likely to do the same. Harry Truman, Dwight Eisenhower, Lyndon Johnson, Gerald Ford, and Jimmy Carter all delivered an annual message in their final weeks in office, though only LBJ and Ford did it as a speech to a joint session of Congress. 6. Some presidents go short in their State of the Union addresses, some go long, very long. Washington holds the record for brevity, using just 1,089 words in 1790. That’s slightly longer than a typical newspaper op-ed. Among presidents since LBJ, Richard Nixon holds the record for shortest State of the Union speech. His 1972 address clocked in at a shade under 29 minutes. Carter holds the record for the longest State of the Union address. His 1981 address, which he (thankfully) delivered to Congress in writing rather than in person, ran 33,667 words. (That’s the last time the State of the Union was delivered in writing.) Bill Clinton holds the record for the longest State of the Union address delivered in person, whether that is measured by the number of words (9,190 in 1995) or by the time it took to deliver (one hour, twenty-eight minutes, and forty-nine seconds in 2000). Trump’s 2017 speech to a joint session of Congress, which again wasn’t called a State of the Union address, ran 5,006 words and lasted one hour and ten seconds. He went longer in his 2018 State of the Union address, offering up 5,834 words and taking one hour and twenty minutes to deliver them. It was the third longest State of the Union address ever. 7. The prose in State of the Union addresses has gotten simpler over time. As the mode of delivering State of the Union addresses has shifted from writing to speaking and as the audience for the addresses has shifted from lawmakers to the country at large, their linguistic complexity has declined. 8. Two presidents never delivered an Annual Message or State of the Union Address. William Henry Harrison and James Garfield both died before they had the chance to deliver one, Harrison from pneumonia in 1841 and Garfield from an assassin’s bullet in 1881. 9. Technology has expanded the State of the Union’s audience. Calvin Coolidge was the first president to have his State of the Union message broadcast by radio (1923). Truman was the first president to have his State of the Union message broadcast on television (1947). Bill Clinton was the first president to have his State of the Union message broadcast over the Internet (1997). 10. While most State of the Union addresses are only remembered by those who wrote them, the ones with a lasting impact have often tackled foreign policy. James Monroe announced the Monroe Doctrine in his annual message in 1823. Theodore Roosevelt added his corollary to the Monroe Doctrine in his annual message in 1904. FDR unveiled his “Four Freedoms” in his 1941 State of the Union address. And George W. Bush warned of the “Axis of Evil” in his 2002 State of the Union address. Corey Cooper assisted in the preparation of this post.